The finest and most comprehensive baroque atlas was Joan Blaeu’s exceptional Atlas Maior, completed in 1665. The original 11-volume Latin edition, containing 536 maps, put Blaeu ahead of his staunch competitor, mapmaker Johannes Janssonius, whose rivalry inspired Blaeu to produce a grandiose edition of the largest and most complete atlas to date. Covering Arctica, Europe, Africa, Asia, and America, Blaeu’s Atlas Maior was a remarkable achievement and remains to this day one of history’s finest examples of mapmaking. This reprint is made from the National Library of Vienna’s complete, colored, gold-heightened copy, thus assuring the best possible detail and quality. The book’s introduction, by the University of Utrecht’s Peter van der Krogt, discusses the historical and cultural context and significance of the atlas; Krogt also provides detailed descriptions of the maps, allowing modern readers to fully appreciate Blaeu’s masterwork. Joan Blaeu (1596 Alkmaar–1673 Amsterdam) was a leading Dutch cartographer and member of the Amsterdam council. Son of Willem Blaeu, also a famed cartographer, Joan and his brother Cornelius took over his father’s workshop in 1638. He became the official cartographer of the Dutch East India Company and would gain further fame with a collection of Dutch city maps entitled Tooneel der Steeden, the first atlas of Scotland, and the masterwork Atlas Maior. Peter Van der Krogt is a leading expert on Dutch atlases. Since 1990, he has been working on Koeman’s Atlantes Neerlandici, the cartobibliography of atlases published in the Netherlands. Van der Krogt is Jansonius curator at the Special Collections of the University of Amsterdam and researcher in the history of cartography at the University of Utrecht. "A book of maps? Well, yes. 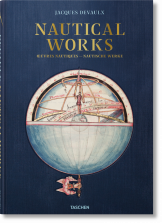 But this deluxe reissue of a 17th century classic - the most famous atlas of its day - is also a visually stunning history lesson."